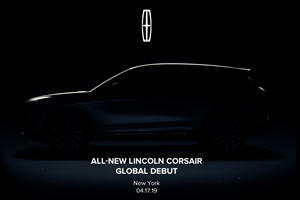 Redesigned, and slated for a rename as the Corsair in 2020, the Lincoln MKC’s new styling is greatly welcomed. Front wheel drive is standard, as is a 2.0-liter turbo-four cylinder developing 245 horsepower, though all-wheel drive is available and certain models get a 2.3-liter turbo engine delivering 285 hp. A six-speed SelectShift gearbox is the sole offering. Four trims range from $33,995 to $47,200 in price, with the Standard, Select, and Reserve comprising the base trio, and the Black Label being the most luxurious, with dual-zone climate, four 12-volt power outlets, heated and cooled front seats, and heated rear seats. The MKC rivals include the Acura RDX, Audi Q5, and Mercedes-Benz GLC. There’s a phrase that gets kicked around to describe Lincoln these days: quiet luxury. It’s not a tagline, exactly. In fact, it wasn’t ever really intended to become common parlance. Rather, it was coined internally to succinctly sum up what the experience of driving a Lincoln is meant to be. It must have struck people as being apt, though, because it stuck as a descriptor that’s now commonly used outside of Lincoln. And it comes to mind quite strongly when describing the 2019 Lincoln MKC. 2019 marks the fifth model year since the MKC first hit the market, which means the time is right to apply some updates. 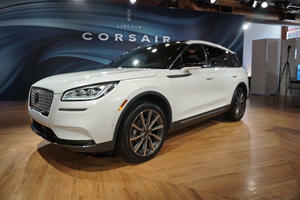 Most of them are welcome improvements that bring Lincoln’s smallest crossover in line with the rest of the brand’s line-up, both in appearance and on-road manners. And it’s also American-built in Louisville, Kentucky, for those who happen to find that an important detail. A few details remain that are worth knowing about, however, and should be weighed against the competition before making a purchasing decision. The MKC, much like the Ford Escape that shares its platform, is a bit of an odd duck in terms of where its size slots in relative to other small crossovers. Some people compare it side-by-side with subcompact luxury SUVs such as, say, a BMW X1, which works with its pricing but not so much its size: the X1 starts at $34,950 and is 175.4 inches long, while the MKC starts at $33,995 and is nearly five inches longer at 179.2 inches. But if you compare it to a larger two-row luxury compact crossover such as the Audi Q5, the numbers still don’t really crunch against its $42,950 base price and 183.6-inch length. The Lexus NX is also a little larger (182.7 in) and more expensive (from $36,485), but the smaller UX, while closer (177.0 in, from $32,000), doesn’t even begin to match the MKC on power (up to 181 total system hp in the hybrid versus a peak of 285 hp with the MKC’s larger engine, which we’ll go into more detail on later). It’s the same situation, almost identically, with the Infiniti QX50 and QX30. The MKC’s closest luxury competitor, then, at 181.0 inches long and a $34,795 starting price, is the new Cadillac XT4. And with a near-perfect size match of 179.1 inches of length, the Mazda CX-5 Signature can be looped in here as well, though it starts a little pricier at $36,890. For the purpose of making as equal a comparison as possible, these two products set a solid baseline. If you’re also considering something a little smaller or larger, the explanations above should help you expand your search accordingly. 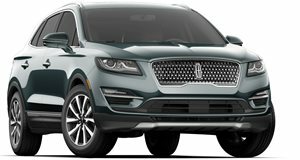 The most significant exterior styling change by far on the 2019 MKC is the shift from the split-wing grille to Lincoln’s latest lower-notched signature grille, which makes a dramatic difference in how stately the car looks when being approached. Subtler new details include updated LED headlamps and the addition of chrome highlighting on the tailgate. The test unit being evaluated here is fitted with the higher-powered 2.3-liter twin-scroll turbocharged four-cylinder engine. Were this a Ford it would be labeled EcoBoost, but Lincoln doesn’t use that name. It comes with all-wheel drive only, and it’s good for a claimed 285 hp and 305 lb-ft of torque at 2,750 rpm. However, those official figures are with 93 octane fuel. If you opt to fill with 91 octane, your real-life peak output will be lower, but it’s still likely above the XT4’s 237 hp/258 lb-ft, and the CX-5’s 227 hp/250 lb-ft. The MKC is hardly a sports car, so this fuel difference amounts to marketing gaming. Most people won’t notice, and what’s left feels like a stout amount of power for this type of vehicle. That said, there’s also the standard 2.0-liter four-cylinder engine, which is the one that’s available with front-wheel drive. It has a single turbocharger and produces 245 hp and 275 lb-ft of torque at 3,000 rpm. Without having tested it myself, I’d imagine that for the way that most people are going to drive a compact SUV, especially in the more fairweather portions of the US, this powertrain would more than suffice. In either case, you’re getting a six-speed automatic transmission. 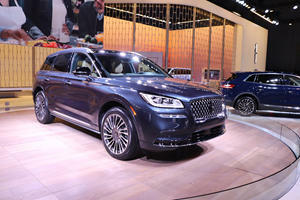 This tester presents a default drive mode that’s poised and relaxed, as Lincoln wants it to be. I find that the sport mode adds an element of dynamism but I paid for that in fuel economy with an average over a week of 17.8 miles per gallon. Granted, that was mostly city driving, but that’s still a somewhat astonishing figure for an SUV of this size. The official EPA figures for the 2.3-liter engine are 18 mpg city, 25 highway, and 20 combined. This also brings to light a minor annoyance: the fuel tank only holds 15.7 gallons. Based on the average I produced over a week, I’d be stopping to top up every 279 miles. That distance just barely gets you from Detroit to Chicago, one way. On its face, the MKC Reserve has a very nice interior with open-pore wood inserts, chrome accents, liberal use of accent stitching, and very attractive branded winter mats that add a nice touch if your locale calls for such a thing. This tester is finished in the Rialto Green upholstery – which, admittedly, I didn’t know was meant to be green until I read the spec sheet – with complementary black ash inserts, which is available only on Reserve models. Dig into the details and things start to come down a notch. In my tester, the chrome was laid out in two different, incongruous shades. (Perhaps this is specific to the green upholstery.) There’s still a bit too much black plastic where there could be softer-touch materials. And the front passenger door has a finishing gap in the inserts that may not bother most people but certainly got my attention. Gear shifting is laid out, as it always has been on the MKC, in a vertical button setup. This certainly frees up plenty of forward cabin space, but I’ve never had much luck getting used to it. Although both have traditional stickshifts, I’m a bigger fan of both the XT4 and the CX-5 in this regard and in overall interior design. The MKC’s 25.2 cu. ft. of cargo space behind the second row and 53.1 cu. ft. with those seats folded isn’t unreasonable in and of itself, and the XT4 is a fair bit smaller at 22.5 cu. ft. and 48.9 cu. ft. respectively. The CX-5 outdoes it at 30.9 cu. ft. behind the second row and 59.6 behind the first row, though. When was the last time someone told you a Mazda had a competitive amount of cargo space? It’s important to know that there’s an enormous amount of variance within the compact and subcompact SUV segments. This is therefore worth careful study if it’s an important purchasing factor. There isn't a ton of interior storage space, as is often the case in smaller crossovers, but what is there is well-considered. Two illuminated USB ports can be found in the smaller forward cubby. Two relatively deep cup holders are present in the center console. One upside of the button-stack gear selector is there's no worry about their contents getting into anyone's way, with additional cupholders available in the front and rear door pockets. The larger center storage bin is roughly average in size and has an upper tray for smaller items that's very convenient if you tend to empty your pockets, but not so much if you're prone to over-stuffing the lower compartment. Quiet luxury is right. It may not be especially dynamic, but what’s nice about the MKC is that it presents a serene cabin that’s enjoyable to spend time in thanks to active noise control and an acoustic windshield and front door glass, and it offers composed drive dynamics that require a minimum of effort. Its steering has a natural and relaxed feel that gives a good amount of feedback without being onerous, and handling is flat with a minimum of pitch or body roll. I should note that this tester has the adaptive suspension equipped, and opting to go without it is likely to produce a different experience. Apart from the initial problems with the shifter layout that have since been resolved, online reports suggest that early-production MKCs have begun to produce some electrical problems with the factory battery fading early, the liftgate’s functioning becoming unpredictable, or the GPS module needing to be replaced. This tester is trimmed as a Reserve ($40,625), which means that it includes auto start-stop technology on the 2.0-liter engine with all-wheel drive and the technology package, which improves combined fuel economy by 1 mpg. The 2.3-liter engine also becomes available here as an option. Blind-spot information with cross-traffic, a hands-free liftgate, heated and ventilated front seats, a power panoramic sunroof and sunshade, and the voice-activated touchscreen navigation system are included. At the base price of $33,995, the 2.0-liter turbocharged four-cylinder is the base engine with front-wheel drive standard and all-wheel drive optional, both with active grille shutters. This price includes Apple CarPlay and Android Auto, 911 Assist, dual-zone climate control, a 4G LTE embedded modem with WiFi hotspot capability, remote start, LED headlights, taillights, and signature lighting, power heated side mirrors with memory, a power liftgate, a 10-speaker sound system, a 12-way power adjustable driver’s seat with heating and memory and six-way adjustable heated front passenger seat, 60-40 split rear seats, active noise control, a leather-wrapped steering wheel, and tire pressure monitoring. A Select trim is also available ($36,750) with auto-folding side mirrors, wood interior inserts, a 12-way power adjustable front passenger seat, and a power tilting and telescoping steering wheel. This is the level at which a variety of packages become available such as the Class II Trailer Tow Package, Climate Package, Select Plus Package, and Sonata Spin Aluminum Trim Package.